The tower and treetop walk is as a seamless continuous ramp made from steel and oak that makes the forest accessible to all – regardless of their physical condition. Camp Adventure Park is located in the preserved forest of Gisselfeld Klosters Skove, one hour south of Copenhagen, Denmark. The forest is graced with spectacular trees, lakes, creeks and wetlands. The route through the trees passes gently and sensitively through different varieties of forest, while minimizing the disturbance of the environment. The treetop walk is split into a higher and a lower walkway. The high walkway will pass through the oldest parts of the forest while the tower and the lower walkway are located in the younger areas. The high walkway also features a series of activities for different user groups to learn and enjoy the forest. 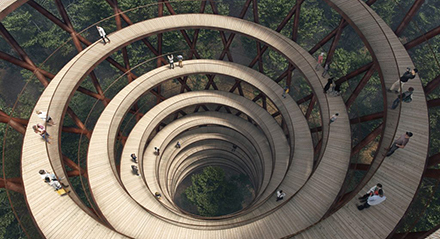 The culminating feature of the treetop walk is the tower and observation deck located 45 meters above the ground. The shape of the tower enhances the visitor’s experience, shunning the typical cylindrical shape in favor of a curved profile with a slender waist and enlarged base and crown. This does not only increase the stability of the tower but also increase the observation deck area at the top of the tower. Furthermore, it also allows for better contact with the forest canopy and its design makes the forest accessible to everyone.